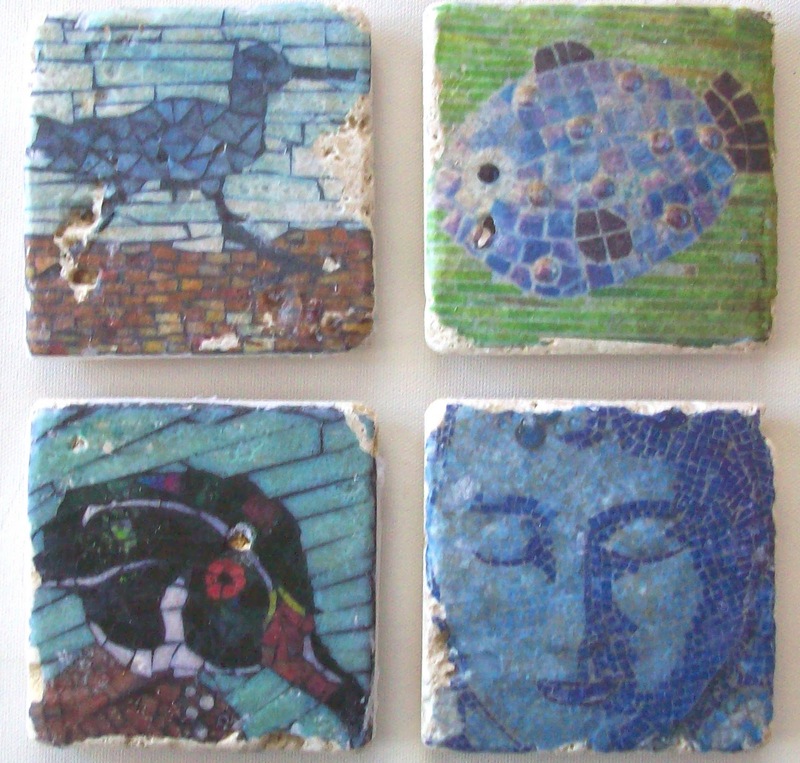 I've been pondering for a long time how to make tiles out of some of my mosaic images. I thought it would be both an interesting project and maybe, over time, a marketing idea. My original plan was to have the images printed onto glazed ceramic tile, but after scouring the Web, I realized that I would have to leave that to the professionals. In the course of my search, however, I found a site called Above the Mark, which is a site that sells rubber stamp dies and other products, but also kindly offers complete instructions on how to transfer images onto tumbled marble tiles. It's time-consuming but fairly easy, using acrylic medium and laser copies. I've made several so far, and I love the antiqued look that results - as if the tiles had been dug up from an archeological site. I can enhance that effect by tinting the medium so the edges are a bit browner. I've stuck small felt circles on the back so they can be used as coasters (these are 4-inch square tiles). They make wonderful and personal gifts. 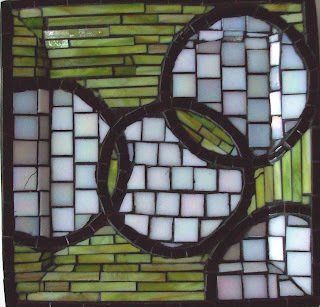 I plan to experiment with larger tiles to offer as trivets. 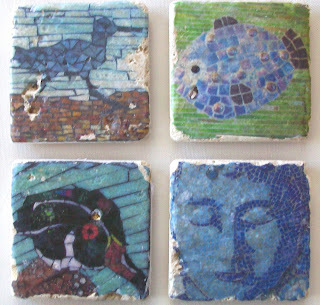 They can also be hung on the wall; one recipient of a Christmas-gift tile coaster is planning to do just that. A few years ago, on a lark, I entered -- and won! -- a local duct tape art contest. My entry was a barn owl, wings spread, clutching a mouse in its talons. The title: "Dinner's Ready!" It won first prize. I was, naturally, completely thrilled, since it was the first time I had entered and won anything in an art show, so it gave me a big confidence boost in the first years of developing my art career as close to a full-time pursuit. My mother loved the picture I sent her so much, I made a copy for her for Christmas that year, and added a wire so she could hang it from a rafter in her kitchen. The next year, I made her a cardinal in flight, which is now hanging next to the owl. This year, I am continuing the tradition with this ivory-billed woodpecker. I personally believe that the ivory bill is still out there, hiding in the swamps of the South, and will rise again when its numbers have increased to safe levels. In my mind, at least, it is still alive and free. A shop owner once told me that people are more likely to buy a piece of art if it has another function, such as a mirror or a plate. I don't mind creating useful art - sometimes creating useful things makes it possible to have the time to create art that is just art - art for art's sake. It would be ideal if all art was considered useful; one could argue that good art is always useful because it makes people think, or feel, something new - even if it's just a new feeling of delightful surprise. Goodness knows, we could all use a bit more delight in life.